Truly amazing very special little quilt that would be wonderful as a wall-hanging or a very elegant crib quilt. Look at all that quilting and the trapunto grapes and leaves. We have seen quilts in museums that utilized trapunto, but we have never before had such a quilt to offer for sale! The fabric is a traditional rustic (but soft) cream white cotton muslin. 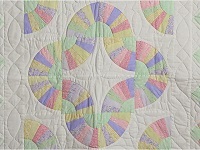 Much of the quilting was laid out free hand rather than with templates giving it the look of an antique quilt. 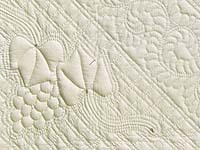 The quilting design was laid out by an Amish woman from northeastern Indiana and the abundant fine quilting was done by an Amish neighbor. The quilt available does not have the golden French knot nibs as pictured here. A great quilt for that special baby boy! Excellent design and workmanship. Appliqued and hand quilted by an Amish woman in her Lancaster County, Pennsylvania home. The back of the quilt is covered with a solid white fabric. Sure to be a treasured heirloom! 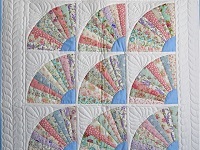 The Grandmother's Fan quilt pattern is rarely made anymore and is therefore very special. 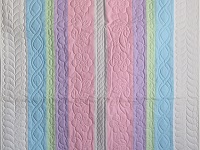 This quilt is extra special with it's lovely border! Be sure to notice the very tiny hand quilted stitches! This quilt is sure to please both young and old. Exceptional workmanship by an Amish lady from Pennsylvania. 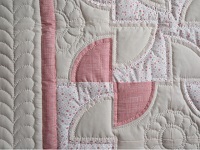 The back of the quilt is covered with a pretty pink dot fabric. Wonderful design! A lovely addition to any nursery. Pretty coral and cream fabrics. The cream fabric has just a hint of blush which coordinates beautifully with the coral. The back of the quilt is covered with the same cream fabric as used on the front. Precise piecework and amazing quilting. Exceptionally well made in northeast Indiana by an Amish woman. Includes a sleeve for a hanging rod. Sure to be a treasured heirloom! 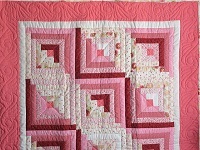 A traditional log cabin quilt in lovely shades of coral and cream. Great fabric selections. Notice the extra fine hand quilted stitches. The back of the quilt is covered with a very pretty tone on tone cream floral fabric. Includes a sleeve for a hanging rod. Well made by a Lancaster County, Pennsylvania Amish woman. 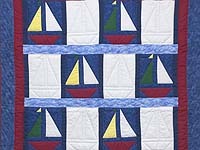 A size that would work great as a throw or a large crib quilt that could also be used on a toddler bed. A lovely pattern that showcases some absolutely beautiful, fine hand quilting. The pastel colors are soft and pretty. Very well made by Pennsylvania Mennonite quilt maker, Connie Lapp. Hand quilted by a friend. The back of the quilt is covered with a solid white fabric like used on the front of the quilt. An extra special, one of a kind quilt that is sure to be a treasured heirloom. Fabulous leaf print fabric! Perfect, modern colors of gray and white. 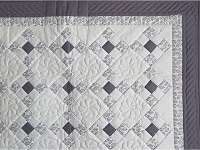 We love the pristine look of the traditional nine patch quilt pattern. It never grows old. All this together with some fine hand quilting makes a really special quilt. The back of the quilt is covered with the same leaf print used on the front. The back side is just as pretty as the front! Well made by Pennsylvania Mennonite quilt maker, Connie Lapp, and hand quilted by her mother. 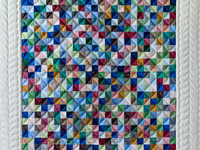 The Grandmother's Fans quilt pattern is very old and rarely made anymore. 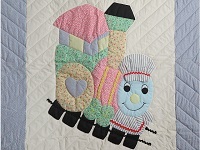 This quilt is sure to be a treasured heirloom for a special new baby. Made with very pretty floral pastel fabrics and a nice solid ivory colored fabric. The back is covered with the same ivory fabric as used on the front. Very well made by Pennsylvania quilt designer, Connie Lapp. Beautifully hand quilted by her mother.